Europe's only man made head high wave park. A revolutionary surf lagoon perfect for Advanced, Intermediate & Beginner surfers. 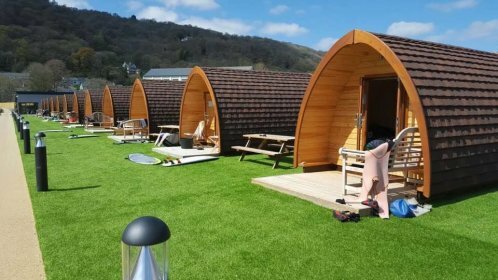 We have 30 glamping pods that face out onto the surf lagoon. Each pod has two single beds and a double mattress, perfect for 2 people or 2 adults and 2 kids. 4 adults should book 2 pods. The facility has very modern showers and bathrooms and plenty of parking space. We have a full bar and restaurant on site. Breakfast is included. You can book your different lessons or a session if you want to free surf by contacting the Surf Snowdonia Team directly. Come join us and experience some of the best waves of your live. Surf Snowdonia is located in Dolgarrog, a small village on the edge of Snowdonia National Park in North Wales. The area is home to epic mountain ranges, beautiful lakes & valleys, and stunning sandy beaches. Its a perfect spot if you want to spend some time hiking, climbing, picnicking and exploring the great outdoors. Liverpool and Manchester city centres are 1.5 hours drive away, and the city of Chester just 50 minutes. Holyhead is a 45 minute drive. 2 Single beds and 1 double mattress. Your First Time Surfer Lesson will teach you all you need to know to get started. With waves guaranteed at Surf Snowdonia, our team of fully qualified instructors aim to get most people standing by the end of the lesson. This is for progressing on to the advanced wave, and the chance for you to ‘drop in’ to an unbroken wave. The lesson will introduce methods for paddling out whilst negotiating breaking waves. You will also develop a quicker and improved take off technique leading to a more controlled ride. FREESURFING - you dont need a guide! Each session equals 55 minutes of wave time. Different areas of our 300-metre lagoon are suitable for different surfer abilities. Advanced surfers stay closest to the central pier where the wave is highest. Intermediate surfers take the waist-high waves towards the outer edges and beginners surf in the bay area on the white water to learn.